A shawl is a piece of fabric worn by women over the shoulders or head. Cashmere/pashmina shawls comes in a range of sizes in length from 72 inch to 80 inch. The width varies between 28 inch to 67 inch. 80 Inches x 40 Inches is a typical dimension of pashmina shawls ; 28 inch wide by 72 inch is also another popular choice. Shawl and pashmina name comes from Kashmir, but it originates from Hamedan Persia. Sources consider Cashmere crafts were introduced by Sayeed Ali Hamadani In the 14th century Mir Ali Hamadani came to Ladakh, home land of pashmina goats where, for the first time in history he found that the Ladakhi kashmiri goats produced soft wool. He took someof this goat wool and made socks which he gave as a gift to king of Kashmir, Sultan Qutabdin. Afterwards Hamadani suggested to the king that they start a shawl weaving industry in Kashmir using this wool. That is how pashmina shawls began. 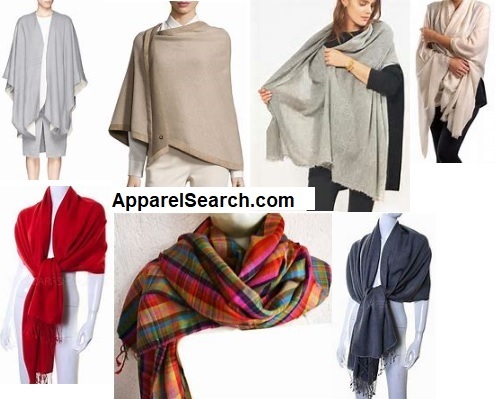 What is the difference between cashmere scarves and shawls? The only difference between scarf, shawl and stole is the size. If you are looking for specific measurements, check the internet. You may find various accounts for the measurements because the fashion industry does not typically follow exact standards. Shawls are used in order to keep warm, to complement a costume, and for symbolic reasons. Apparel Search is a leading guide to fashion, style, clothing, glam and all things relevant to apparel. We hope that you find this ladies cashmere shawl page to be helpful. What ever accessories you are wearing today is in fashion. If you want to be even more stylish, you should wear your women's cashmere shawls. You may also want to learn about women's cashmere scarves.